Teradek is a privately held R&D company offering a wide range of state-of-the-art networking video products. Teradek is located on southern California’s Titanium Coast in Irvine, a hotbed of technology surrounded by top engineering schools and a healthy ecosystem of technology vendors. The Cube™ Family are the world's first camera-top streaming HD video devices. The family includes six encoder models and two matching form-factor decoders. The Cube™ Encoder streams HD video over WiFi or wired Ethernet, can create its own wireless (ad hoc) network, over which it streams HD video directly to a Cube™ Decoder, a computer or laptop, a server, or a mobile device such as an iPad with no other networking equipment required. To extended your broadcast range, Cube™ Encoder can join an infrastructure network by using a wireless router and stream over a LAN or WAN. Experienced network users can use Cube™ to stream video over the Internet, or to video mixing applications like VidBlaster. Cube™ Encoders and Decoders can be purchased in pairs that factory default to a point-to-point (ad hoc) WiFi connection. Together they provide an end-to-end streaming video solution for filmmaking, news gathering, and ProAV. The Cube™ Decoder is a small, extremely low-power video decoder that pairs ideally with the Teradek Cube™ Encoder. They are designed for placement on small handheld monitors and large HD displays and feature either HDMI or HD-SDI output. Using a Cube™ Decoder eliminates the need for using a PC to receive and decode video. Cube™ Encoder/Decoder pairing is the ideal solution for turnkey on-set video monitoring. Use the Cube™ Encoder to stream HD video over WiFi, then connect the Cube™ Decoder to a small hand-held monitor or a professional field monitor to receive the signal and view video up to 1080p24. 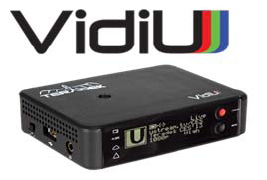 Cube decoders are available in both HDMI and HD-SDI versions. For news gathering the Encoder/Decoder pair allows broadcasters to disconnect from the ENG vehicle, eliminating the need for long cable runs, giving the advantage of freedom of movement to the journalist and cameraman for capturing the critical action. Cube is tiny (about the size of a pack of cards), uses only 2.5W of DC power, weighs about 200g, and mounts easily to a rail system, cage, hotshoe, or camera baseplate. Cube's line-of-sight WiFi range is approximately 300 feet when used with a high quality WiFi access point. Cube has been tested extensively with RED ONE**, Arri Alexa, Panavision Genesis, Canon 5Dii, Canon 7D, various handi-cams and more. **Cube is not compatible with RED ONE's HDMI output as its output is non-standard. Cube works beautifully with RED ONE's HD-SDI output.